Air Projector is designed to be familiar to anyone who has used the Photo app on the iPhone. It can project any image stored in your Photo Library, including the camera roll. 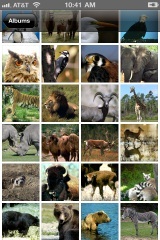 Select a photo to project it on the screen. When viewing a photo, tap to toggle the navigation controls. Tap and hold to show a virtual laser-pointer on the screen. Tap on the arrow buttons or swipe to change pages. The Full Edition of Air Projector can also project PDF documents, including slide decks exported from PowerPoint or Keynote. View the PDF document from Mail or a third party document manager that supports the "open in" function. Air Projector doesn't store or manage PDF files directly. However, it works very well with third-party cloud document managers such as Dropbox. Want to Project Live Camera Images? Air Scanner turns your iPhone into an HD document camera. What if I Have an iPad? Check out Air Sketch for projecting PDF presentations on the larger screen. In addition to PDF support, you can also annotate your slides. Air Projector works with the latest versions of all popular browsers, including Internet Explorer 7+, Safari 5, Firefox 3.6, and Google Chrome. Note: Most public hotspots allow client-to-client communication, which Air Projector relies on to work. However, some network administrators may choose to explicitly disable this feature. For better performance, use Air Projector with a direct ad-hoc network connection. Air Projector is designed to work optimally with a single computer connected to the same local network as your iPhone / iPod Touch. For a remote audience, use desktop sharing software (such as iChat for Mac), and dedicated online meeting services (such as WebEx) for larger audiences. If you are running Air Projector on a public or large network, secure your sessions by turning on the "Require Login" switch and specifying a username & password. You generally won't need to change the default port, unless there is another multi-tasking app using the same port on your device. We recommend keeping it at the default 8081 unless you need to change it. 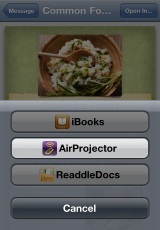 Thanks for Downloading Air Projector! We believe that we've only begun to scratch the surface of what's possible with the iPhone and multi-touch devices. If you find Air Projector useful, or have other uses in mind, please drop us a line and let us know about them. We love to hear from you! If you like Air Projector, please consider taking a moment to rate us in the App Store. We really appreciate it! Want to do more with your photos? Grab a free copy of Fontpress. Click here to share Air Projector with your friends on Twitter! Read our blog for the latest tutorials, tips, and tricks. If you like Air Projector, also check out Inkflow: The Ultimate Notebook and Visual Thinking App for your iPhone, iPod Touch, and iPad. Return to the Air Projector home page.